House Intelligence Committee Chairman Devin Nunes believes that Americans “will be shocked” to discover the information beneath the redactions in the recently-declassified secret court documents which the FBI used in 2016 and 2017 to spy on former Trump presidential campaign volunteer Carter Page. Nunes made the remarks in a “Fox Sunday Futures” interview aired on July 29, days after the Justice Department released 412 heavily redacted pages of the Foreign Intelligence Surveillance Court (FISC) applications and warrants used to surveil Page, an American citizen, over the course of a year. The release of the documents confirmed that the bulk of the application to surveil Page relied upon an unverified opposition research dossier on then-candidate Donald Trump paid for by the Hillary Clinton campaign and the Democratic National Committee. The documents also revealed that the FBI failed to disclose to the court who funded the dossier. 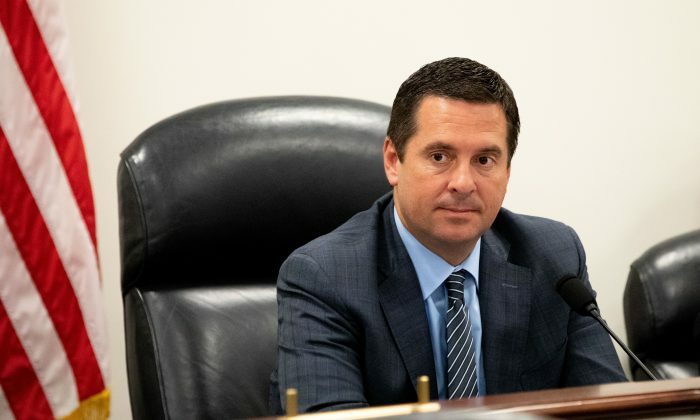 Nunes and the Republicans on the intelligence committee sent a letter to President Donald Trump on June 14 asking to declassify 20 pages of the FISC documents. The Justice Department declassified the documents more than a month later, but the document trove is still heavily redacted. Nunes claims that bombshells lie beneath. “If people think using the Clinton dirt to get a FISA is bad, what else that’s in that application is even worse,” Nunes told The Wall Street Journal. Asked whether Trump is considering the committee’s request, White House Press Secretary Sarah Sanders said on July 23 that Trump chose to remain uninvolved in the investigation. “He said repeatedly that he wants the Department of Justice to be fully transparent with these requests from Congress, and he’s going to continue, at this point, to remain uninvolved,” Sanders said. “However, he sees more and more, every single day, that this is proving further and further to be a total witch hunt, particularly because it was based on a false and unverified and discredited dossier,” she added. Page has not been charged with any crime after a year surveillance. He disputed the claims in the FISC documents which paint him as a Russian agent. A group of 11 house lawmakers sent a criminal referral to investigate the officials involved in signing the warrant applications, including Comey, former FBI Deputy Director Andrew McCabe, former Acting Attorney General Sally Yates, and former Acting Deputy Attorney General Dana Boente. The lawmakers accuse the officials of depriving Page of his civil rights and of investigative misconduct. The FBI officially started the counterintelligence probe of the Trump campaign on July 31, 2016. The House Intelligence Committee’s investigation also revealed that the bureau ran informants against the campaign prior to that date. Peter Strzok, the lead agent in the FBI’s Trump counterintelligence probe was also briefly part of Mueller’s team. The special counsel removed Strzok after seeing text messages between Strzok and his mistress at the FBI, Lisa Page. Strzok expressed bias against Trump and in favor of Clinton while conducting the investigation. Strzok said that he will “stop” Trump from becoming president, believed that Clinton should win “100,000,000 to 0,” discussed an “insurance policy” in case Trump won, and mused about impeachment days after joining Mueller’s team.